Interpreting a melody, knowing how to accompany, improvise, make an arrangement. These are the objectives of this method book and they are also the ingredients needed to play together with other musicians in a more conscious and immediate way. I believe the best way to learn is through direct experience, so I’ve written a practical method for deciphering the kinds of chord symbols and melodies you’ll find on a lead sheet. While its focus is on the harp, this method book can be adapted to any instrument. The information in it builds gradually and the theoretical aspect is always thought of in relation to listening and actual playing: with an abundance of exercises to practice alongside the theoretical part as well as 10 original tunes whose increasing difficulty afford the player the opportunity to apply newly acquired skills. “I play everything in C major, even if four of my pedals are flats or two are sharps…”, a dear friend of mine and fine harpist liked to say. She meant it jokingly but it has a basis in truth: once you have the pedal set-up, the music can be read without worrying about sharps and flats, as if everything were really in C major. So the harp, unlike other musical instruments, can basically be played without giving thought to the key that you’re playing in. This is not possible in jazz: harmonic awareness is an inescapable condition for playing this music. 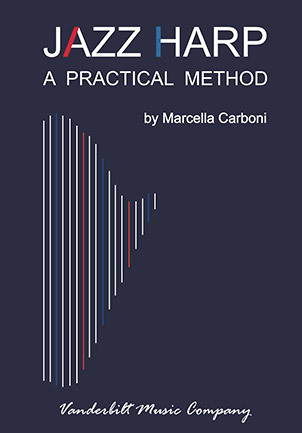 This method book is intended for the player with a good mastery of pedal harp technique who wants to explore the world of jazz, improvisation and, more generally, modern harmony applied to the harp. The harp has great potential in jazz and improvised music. The evidence for this can be seen in the many musicians playing throughout the world today and in the technical developments of electro-acoustic harps. Familiarizing yourself with the history of jazz harp can motivate you to discover or rediscover the infinite possibilities of timbre, harmony and melody of our instrument. The many examples of recommended listening are essential to understanding that everything written on these pages has a practical application on our 47 strings. Redazione Redazione di IN CHORDIS, la rivista online dell'Associazione Italiana dell'Arpa.